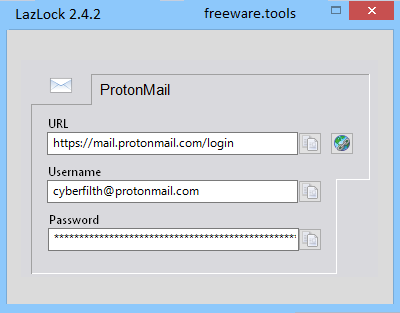 LazLock is a lightweight, portable password manager. It doesn't need to be installed on your computer, so can be run from a USB stick. Carry both the Windows and the Linux versions with you and you'll be able to access your passwords from any PC. It also has an option to create strong, random passwords for all of the websites that you visit, you only need to remember one password to unlock them all. Your data is strongly protected with 128 bit AES encryption. In other words and simply stated, this tool allows you to safely store and manage all credentials associated with your banking, media, email, social networks, education or work etc. Regardless of whether you are logging in your social network accounts, prefer online shopping or just want to check your email, chances are that you probably logged in dozens of websites already. LazLock is a lightweight piece of software designed to help you manage your dozens of secure and unguessable passwords that you are using on a regular basis to access various services online. Since the application is portable, it means that the installation is a quick and painless process that entails decompressing the archive in any desired location on your local drive. Upon launch, you come face to face with a clean and intuitive interface that is easy to navigate and understand, irrespective of your computer skills. The UI is comprised of two panels, the one of the left being dedicated to displaying the category list available. The feature that can be helpful in the long run, as you accumulate more passkeys. The blank window on the right has the role of displaying the credentials along with three text boxes that include URLs, usernames and passwords. Functionality-wise, the program is as easy to use as it gets and adding a new entry is a forthright operation that does not take too much time. To put it simply, you can add a new entry by specifying the category, name of the site, web address, username, password and selecting an appropriate icon. You will be happy to learn that the application includes a password generator that can lend you a hand when you are creating a new account or change your current pass phrases. Therefore, you can generate a new password that features uppercase, lowercase, brackets, numbers, symbols, spaces and the desired length. The importance of using strong and hard-to-guess passkeys for each of the accounts you create online cannot be stressed enough. LazLock does not only help you manage your password collection but can also lend you a hand with upgrading their strength and hence, making them harder to break.